How much does it cost to travel to Laos? How much money will you need in Laos? ₭250,894 ($29) is the average daily price for traveling in Laos. The average price of food for one day is ₭96,690 ($11). The average price of a hotel for a couple is ₭195,526 ($23). Additional pricing is in the table below. These average travel prices have been collected from other travelers to help you plan your own travel budget. How much money do I need for Laos? Laos is one of the poorest countries in Southeast Asia, and as a landlocked country with a small handful of attractions, it is often overlooked. Travelers who do come to this country come for the laid back atmosphere and beautiful landscape with striking sunsets and welcoming people. Throughout the country you'll find colonial French towns and beautiful Buddhist stupas. While it may be less popular, when you look at the subtleties, Laos has plenty to offer. Laos is one of the most relaxed countries in Southeast Asian. Because tourism is not as popular, it has a more mellow vibe and it is the perfect place to let the days slip away in a peaceful and beautiful setting. Most visitors to this country and traveling through other parts of Southeast Asia as well. This is a great place to meet fellow backpackers, exchange tips, and rest after some grueling journeys. Although Laos has a small population, there are still a wide range of ethnic groups. Three quarters of the population fall into the Lao, Khmou, and Hmong groups. Popular experiences during a trip to Laos include a visit to the golden Phra That Luang temple and Wat Si Saket, the site of 2,000 Buddha statues. Enjoy the growing industry of ecotourism or take a longtail boat ride down the Mekong River. Tubing is one of the most popular activities in Laos. The climate in Laos is broken down into three different seasons. The hot season runs from March to May and temperatures can soar. The wet season, between May and October, is a little cooler, but tropical downpours are frequent. July and August are the worst months for rain, and some flooding in not uncommon. The dry season is between November and March. During this time there is far less rain and temperatures are much cooler. This is the peak season in Laos. There are several options for traveling around Laos. Minibuses are a faster, but more expensive option. VIP buses are older and break down often, but they are more comfortable with more space for the traveler. Some perks may also be included in your fare such as a bottle of water and a lunch or dinner. Air conditioning is usually available but may be broken. Renting a car is the most expensive, but most convenient option for navigating the country. The Lao currency is the kip. Some places will accept the US dollar, although this should not be expected. In touristy areas the euro may also be accepted. There are plenty of ATMs in Vientiane and some can be found in other cities such as Luang Prabang, Vang Vieng, Savannekhet, Tha Khaek, among others. You can purchase made-to-order clothing in Laos, but expect low quality material. Alternatively, a popular purchase is Handmade Lao silk, which can be found at the Morning Market in Vientiane. Make sure the silk is authentic and not the cheaper, synthetic form that is imported from China or Vietnam. Vieng Xai: This town offers a unique view into Laos' past. It served as the headquarters for the Pathet Lao during the US led bombings in the 1960's. The headquarters was based in the limestone karst cave networks found throughout the towns. The caves created a "hidden city" that support about 20,000 people over the course of 9 years. It was a functioning community with schools, hospitals and markets. Today, daily tours are available of the caves. Wat Phu: This is the site of ruins from a Kindu Khmer temple complex in the Champasak province. It dates back to the 12th century and has some similarities to Angkor Wat. 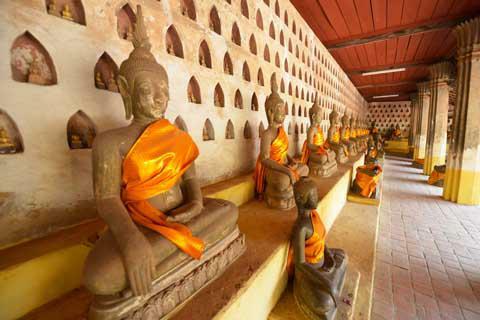 Pha That Luang: Laos is a Buddhist nation and temples are one of the most common attractions for visitors. This stupa is the national symbol and most significant monument in the country. It dates back to the 16th century and is found in the capital city of Vientiane. Food in Laos is somewhat similar to that found in Thailand. There are several comparable dishes, although slight variations in the preparation techniques and ingredients may be obvious. The food is prepared very spicy and is more often bitter instead of sweet. It is made with lots of fresh herbs and vegetables and rice is the staple carbohydrate. Laap: This is the national dish of Laos, and is sometimes referred to as larb. It is a salad of minced meat that is made with herbs, spices and lime juice. It is often served spicy with a large amount of chili. It is different from the Thai version of this dish because it is usually made with raw meat instead of the cooked variety. Tam Maak Hung: This is a spicy green papaya salad. It is similar to som tam, which is found in Thailand, although it has a stronger flavor due to the fermented crab and fish sauce that is typical in Laos. Khao Jii Pat-te: This is a common option throughout Laos and is essentially a French baguette that has been stuffed with a pate. If you've been moving swiftly through Southeast Asia, giving each location a couple of days, then Laos is a great place to slow your pace and soak up some of the atmosphere. Laos is more about the atmosphere than it is about checking sights off a list, so spend some time in the less touristy Southeast Asian country and mellow out a little bit. You'll find other travelers here for sure, but Laos is more about soaking up the local culture. Don't swiftly pass through here because you'll only regret it in the long run.